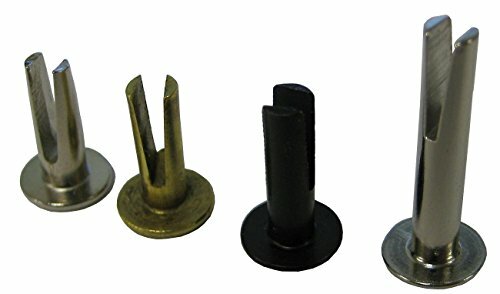 SPLIT RIVET - 9/64" DIAMETER X 3/8" LENGTH, 5/16" HEAD DIAMETER, STEEL, OVAL HEAD WITH A BRASS FINISH. (PACK OF 100). View More In Split Rivets. If you have any questions about this product by Hanson Rivet, contact us by completing and submitting the form below. If you are looking for a specif part number, please include it with your message. SPLIT RIVET - 9/64" DIAMETER X 5/16" LENGTH, 5/16" HEAD DIAMETER, STEEL, OVAL HEAD WITH A BRASS FINISH. (PACK OF 1000). SPLIT RIVET - 1/8" DIAMETER X 7/16" LENGTH, 7/32" HEAD DIAMETER, STEEL, OVAL HEAD, NICKEL PLATED. (PACK OF 1000). SPLIT RIVET - 9/64" DIAMETER X 3/8" LENGTH, 5/16" HEAD DIAMETER, STEEL, OVAL HEAD WITH A BRASS FINISH. (PACK OF 500). SPLIT RIVET - 1/8" DIAMETER X 1/2" LENGTH, 7/32" HEAD DIAMETER, STEEL, OVAL HEAD, NICKEL PLATED. (PACK OF 500). SPLIT RIVET - 9/64" DIAMETER X 3/8" LENGTH, 5/16" HEAD DIAMETER, STEEL, OVAL HEAD WITH A BRASS FINISH. (PACK OF 1000). SPLIT RIVET - 1/8" DIAMETER X 1/2" LENGTH, 7/32" HEAD DIAMETER, STEEL, OVAL HEAD, NICKEL PLATED. (PACK OF 1000). SPLIT RIVET - 9/64" DIAMETER X 7/16" LENGTH, 5/16" HEAD DIAMETER, STEEL, OVAL HEAD WITH A BRASS FINISH. (PACK OF 500). SPLIT RIVET - 1/8" DIAMETER X 9/16" LENGTH, 7/32" HEAD DIAMETER, STEEL, OVAL HEAD, NICKEL PLATED. (PACK OF 500). SPLIT RIVET - 9/64" DIAMETER X 7/16" LENGTH, 5/16" HEAD DIAMETER, STEEL, OVAL HEAD WITH A BRASS FINISH. (PACK OF 1000).